It was as much a part of Christmas Day as the Queen's Speech and Turkey and Plum Pudding. The Morecambe and Wise Christmas Day Special was an event not to be missed - even the Queen was said to have delayed her official dinner to watch it. The legendary comedy duo's Christmas Specials began in 1969, but the phenomenon exploded in 1971 when the first, lavish, extended Christmas production was broadcast. Shirley Bassey sang in hobnail boo..
Own Morecambe & Wise Series 1 to 2 Surviving Episodes DVD from Deff, DVD, Blu-Ray & 4K Video Specialists - Free UK Delivery..
Own Morecambe & Wise Series 1 to 9 Complete Collection DVD from Deff, DVD, Blu-Ray & 4K Video Specialists - Free UK Delivery.. Including all six episodes from Series Three of the BBC’s The Morecambe and Wise Show – and their 1970 Golden Rose of Montreux entry. Including guest stars Ian Carmichael, Fenella Fielding, Diane Cilento, Edward Chapman and Richard Greene. The BBC series of the Morcambe and Wise show was one of the most popular television series ever and represented the legendary comic duo at the height of their powers. In their magnificent sketches, m.. Including all six episodes from Series Six of the BBC’s The Morecambe and Wise Show. Including guest stars Cilla Black, Percy Thrower, John Mills, Mrs Mills and Tom Jones. The BBC series of The Morecambe and Wise Show was one of the most popular television series ever and represented the legendary comic duo at the height of their powers. In their magnificent sketches, musical numbers and magical tomfoolery, they would captivate an audie..
A special compilation celebrating some of this legendary comedy duo’s finest comedy sketches recorded at the BBC. Compilation of sketches featuring the much-loved funnymen Eric Morecambe & Ernie Wise. Includes: Grieg Piano Concerto (featuring Andre Previn) Backing Piano – “Play A Simple Melody” (featuring Elton John) News Flash (featuring Angela Rippon) “There Ain’t Nothing Like A Dame” (featuring Micheal Aspel, Frank Bough & Barry ..
Own Morecambe & Wise - The Movie Collection DVD from Deff, DVD, Blu-Ray & 4K Video Specialists - Free UK Delivery.. Featuring guest appearances from Eric Porter, Kenneth McKellar, Dusty Springfield, Michael Redgrave and Robin Day. The BBC series of The Morecambe and Wise Show was one of the most loved television series ever and represented the legendary comic duo at the height of their popularity. In their magnificent sketches, musical numbers and magical tomfoolery, they would captivate an audience of millions and leave a thousand hilarious memories.. Including all seven episodes from Series Five of the BBC's The Morecambe and Wise Show. Including guest stars Flora Robson, Arthur Lowe, Glenda Jackson and Ian Carmichael. The BBC series of The Morecambe and Wise Show was one of the most popular television series ever and represented the legendary comic duo at the height of their powers. 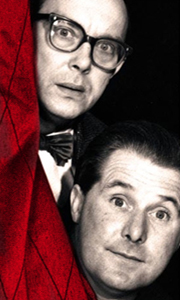 In their magnificent sketches, musical numbers and magical tomfoolery, they would captivate an audie..
Own Morecambe & Wise Series 9 DVD from Deff, DVD, Blu-Ray & 4K Video Specialists - Free UK Delivery..